30 million unique devices around the globe. We’ve never been more excited than we are right now, standing at this remarkable moment in history. Taken together, these numbers clearly show that every day, more and more people, from literally all over the world, are choosing to take their Bibles with them everywhere they go. And if you use the Bible App yourself, then of course you already know why: Because the Bible App makes it easier and faster than ever to engage not just with God’s Word, but with His people. No matter where you are, what you’re doing, or even which of YouVersion’s 45 languages you prefer—your Bible App is right there with you. 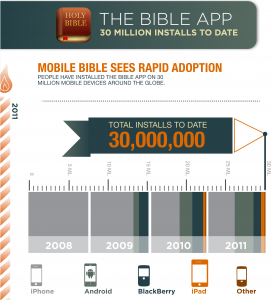 If you haven’t already installed the free Bible App on your mobile device, it’s not too late! Get it now on iPhone, iPad, iPod touch, Android, BlackBerry, Windows Phone, HP WebOS, Java, and almost every other mobile platform. If you do have the Bible App, then this milestone is a celebration of you. Thank you for the part you have played in helping get the Bible not just more into your own life, but sharing it with your friends and seeing it touch them too. It’s because of you that literally tens of millions of other people are connecting with the Bible. Together, let’s keep spreading the story of God’s love, one (more) person at a time.